The term impact crater chain is commonly used when there are three or more lined up impact structures that have formed in a single impact event. Apart from a few established paired craters (e.g., Clearwater West and East in Canada, Ries and Steinheim Basin in Germany), three terrestrial crater chains with well-separated structures have so far been proposed. The alignment of eight structures in Missouri, USA, is peculiar, but age considerations do not speak in favor of a single event, and only two of them are established impact craters. The well-known Aorounga impact structure in the Chad may be accompanied by one or possibly two additional craters, but respective field evidence is lacking. In 1998, a single impact event thought to have formed five individual structures, though spread over two continents, has been suggested (see http://www.lpi.usra.edu/meetings/LPSC98/pdf/1806.pdf). On the other hand, multiple impact structures are well known from the Moon, Mars, Venus, and Jupiter’s satellites Ganymede and Callisto. Especially the detection of the impressive crater chains on Ganymede (Fig. 1) and Callisto, mysterious until the 1994 crash of the torn Shoemaker-Levy 9 comet with Jupiter, raised new interest and initiated investigations about multiple impacts by disrupted asteroids and comets. Fig. 1. 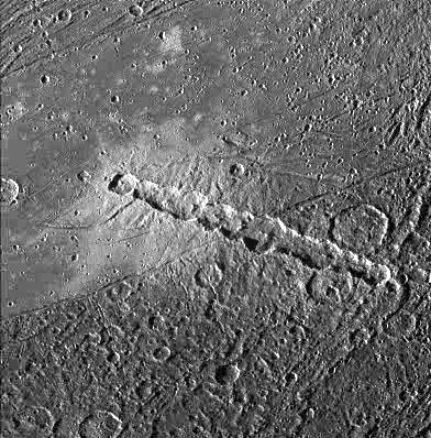 Torn Ganymede crater chain: http://apod.nasa.gov/apod/ap011215.html; Galileo Project, Brown University, JPL, NASA. Fig. 2. The Azuara multiple impact event produced a crater chain of about 120 km length. Apart from the more circular Azuara impact structure and the elongated Rubielos de la Cérida impact basin a conspicuous Torrecilla ring could be a further companion impact site that needs however more detailed investigation. In the August 2003 issue of Meteorite, the International Quarterly of Meteorites and Meteorite Science, a report on a more or less continuous crater chain, the first of this kind known on Earth, of more than 100 km length, is given (see http://www.impact-structures.com/2011/12/an-impact-crater-chain-in-northern-spain-2/). The chain (Fig. 2) comprises the previously established Mid-Tertiary Azuara impact structure in Spain (see http://www.impact-structures.com/ ), the nearby Rubielos de la Cérida companion crater (see http://www.impact-structures.com/impact-spain/6th-impact-workshop-granada-spain/posters/impact-melt-rocks-shock-metamorphism-and-structural-features-in-the-rubielos-de-la-cerida-structure-spain-evidence-of-a-companion-to-the-azuara-impact-structure/ ) as part of an elongated impact basin, and a ring structure (Torrecilla, 12 km diameter) suggested to be also of impact origin. The event that formed these impact structures is now called the Azuara multiple impact event. The detection of the suggested impact crater chain has been a long process. It begins in the eighties and early nineties with the establishment (by K. Ernstson and co-workers) of the 40 km-diameter Azuara impact structure at the margin between the Alpidic fold belt of the Iberian Chain and the Tertiary Ebro Basin. In 1994, K. Ernstson and co-workers made a first reference to a suspected companion crater, the Rubielos de la Cérida structure, of similar size, located some 50 km south-southwest of the Azuara structure, and of the same Mid-Tertiary age. In the following years, Rubielos de la Cérida could be shown to present all evidence of an impact structure. It exhibits the complete impact inventory as are a distinct morphology including a prominent central uplift, peculiar structural features, extended impact ejecta, suevite breccias, impact melt rocks, and strong shock metamorphism. Meanwhile, more field work and petrographic analyses have shown that, actually, Rubielos de la Cérida is not a circular impact structure but forms the northern end of an elongated basin. Its rims are running roughly in the north-south direction, and also the Rubielos de la Cérida central uplift extends to the south in the form of a mountain chain more or less symmetrical to the rims of the elongated basin (see Fig. 2). This peculiar continuation of both the Rubielos de la Cérida central uplift and basin is closely connected with the omnipresent occurrence of well-known impact features in rocks already documented in the original Rubielos de la Cérida impact structure. The impact evidence comprises structural features, abundant monomictic and polymictic breccias and breccia dikes, extensive megabreccias and petrographical significance in the form of impact glass and shock metamorphism. The reader is invited to follow up the fingerprints of this giant impact event here and now (Fig. 3). Fig. 3. Map for general orientation in the multiple impact field of the Azuara impact structure and the Rubielos de la Cérida impact basin. CAL. = Calamocha, CAM = Caminreal, CAR = Cariñna, MUN = Muniesa; A-23 = Autovía Mudéjar. In 2011 the ESA’s Mars Express has returned new images of an elongated impact crater in the southern hemisphere of Mars. Probably, the crater was caused by a train of projctiles and thus may be considered a model for the formation of the Rubielos de la Cérida elongated impact basin (Fig. 4). Vice versa, a thorough study of the impact features from the Azuara/Rubielos de la Cérida multiple impact event could contribute to a better understanding of impact features on other planets and their moons. This will remain illusory however as long as regional geologists and a few influential members of the so-called impact “community” are further on keeping the Spanish impacts under wraps. Fig. 4. 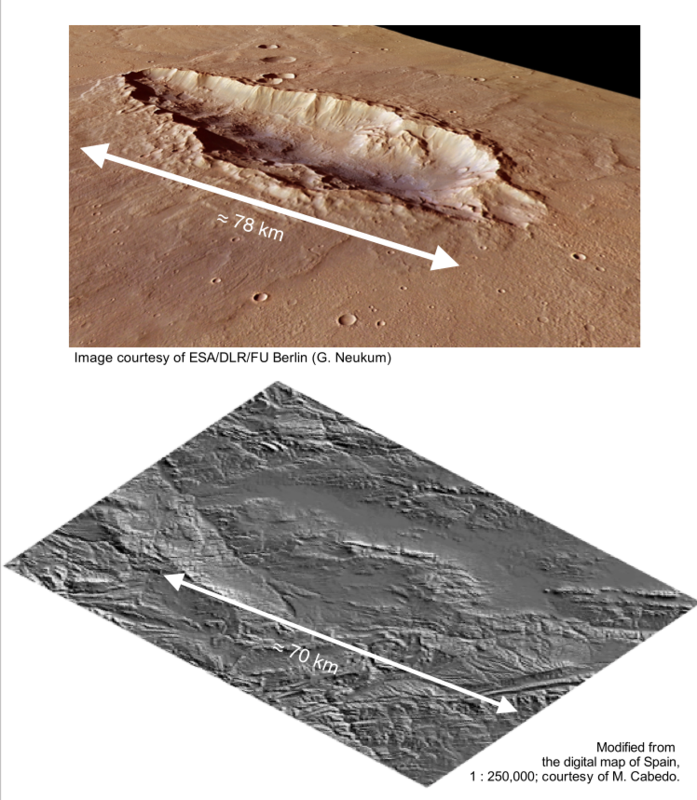 Mars on Earth: An elongated impact crater on Mars and the Rubielos de la Cérida impact basin of comparable size and shape.